Chase Headley’s solo home run in the 12th inning gave the San Diego Padres a 2-1 win over the Milwaukee Brewers on Wednesday night at Miller Park. Headley’s game winner came off of Alfredo Figaro, who was working on his third inning of relief. It ended a 4-game Brewers winning streak and dropped Milwaukee’s home record to 6-5. They’re 9-1 on the road this season. Brewers starter Yovani Gallardo turned in a solid effort on the mound, working seven innings and allowing one run on five hits. He walked two and struck out four. Even though Gallardo didn’t get a decision, he improved to 5 for 5 in quality starts. The Brewers as a team have 16 quality starts in 21 games. The Brewers only run came off Scooter Gennett’s solo home run, his first of the year. The two teams play the rubber match of the series at Miller Park tonight. Kyle Lohse (3-1, 2.67) shoots for his 4th win of the season. He’ll face San Diego’s Tyson Ross (2-2, 2.13). 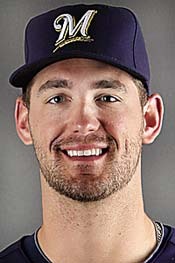 Brewers pitching prospect Johnny Hellweg faces the possibility of undergoing Tommy John surgery after suffering an injury in his last outing for Triple (A) Nashville. Hellweg is the 4th ranked prospect in the Brewers farm system by Baseball America. The Milwaukee Brewers scored four runs in the second inning and knocked off the New York Mets 4-2 in their series opener at Citi Field in New York last night. Rookie Johnny Hellweg made his 7th start of the season. He had to be removed after four innings because of control issues. Hellweg only allowed two hits and one run but walked four batters, hit two more and tossed a wild pitch for good measure. The Mets had several chances to put more runs on the board, but went 0 for 14 with runners in scoring position. Hellweg won the Pacific Coast League Pitcher of the Year honors, but his success in the minors didn’t translate to the majors. At this point, it would be difficult for the Brewers to pencil Hellweg into the mix for a spot in the 2014 starting rotation. The Milwaukee Brewers have announced their 2013 Robin Yount Performance Award winners, which go to the top player and pitcher in their minor league system. Johnny Helweg is the organization’s top pitcher and first baseman Jason Rogers is the top player. The 24-year-old Hellweg spent most of the season at Triple-A Nashville and was named the 2013 Pacific Coast League pitcher of the year. He went 12-5 with a 3.15 ERA in 23 starts. Hellweg, who was acquired from the Angels in the Zach Greinke trade, made his debut with the Brewers earlier, going 0-3 with a 10.97 ERA in four games. Hellweg just rejoined the Brewers as a September call-up. The 25-year-old Rogers played the entire season at Double-A Huntsville, batting .270 with 22 homers and 87 RBIs in 133 games. He led the Southern League in RBI’s and ranked among the league leaders in home runs. Nashville Sounds pitcher Johnny Hellweg was named the Pacific Coast League Pitcher of the Year today. Hellweg went 11-5 with a 3.16 ERA in 22 starts for the Sounds. He ranks 2nd in the PCL in ERA and is tied for 2nd in wins. Hellweg becomes the fourth pitcher in the Sounds’ 36-year franchise history to capture his league’s Pitcher of the Year honor. The Milwaukee Brewers prospect has gone 10-1 in his last 15 starts. Hellweg joined the Brewers organization after spending four years in the Angels system. He was acquired from Los Angeles last July in the Zach Greinke deal. The much anticipated debut of Brewers pitcher Johnny Hellweg has not gone the way anyone would have hoped. Making his third start for Milwaukee Wednesday, Hellweg was roughed up again as the Brewers fell to Cincinnati 6-2. Heading into Tuesday’s game with the Cincinnati Reds, Milwaukee Brewer starting pitchers were in a 407-game stretch without a complete game. Yovani Gallardo was the last to toss all 9-innings back on April 5th of 2011. Wily Peralta put a stop to that run as the Brewers blanked the Reds 2-0 at Miller Park. Peralta tossed a 3-hit shutout while striking out 6 and walking 4.